A picture is worth a thousand words. Although cliché, this phrase holds clout in the world of inbound marketing, too. People like to look at pictures or graphics to learn and pull information, rather than lines and lines and lines of text. In today’s virtual society, infographics can be a great way to incorporate information to teach your audience at the same time. Why not provide your customer or audience with a visual to convey your message or provide product information? An infographic is just that… information in graphic (picture) form. So what makes an awesome infographic? 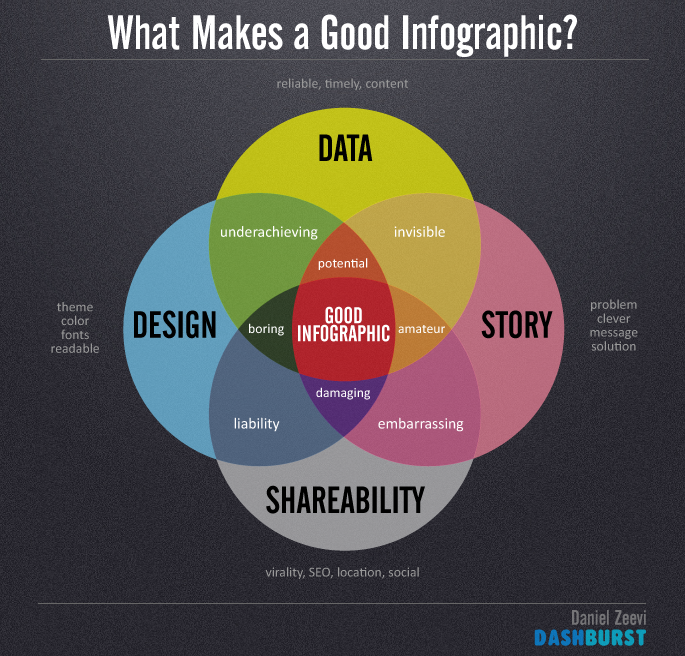 According to the image above, there are four main points: data, design, shareability, and story. You want to make sure your image hammers home your main points in a timely manner, is easy on the eye in regards to color/fonts/theme, is shareable on social media streams and online, and provides an easy solution to a problem. The sweet spot of an infographics is when you can incorporate all four points. Add a mix of one or two and leave the others out? You’ve got a recipe for a weak image that potential customers are likely to skip right over. But, what if you have build something that you love, but you’re unsure about whether it will speak to your audience and buyer personas? QuickSprout gives these tips for making sure your infographic is simply irresistible! Nobody wants to read information from a source that they don’t trust. When you’re creating your infographic, make sure to include lots of data from credible sources. If you create something that is pretty, but lacks substance, your readers and followers will be anything but impressed. While a good amount of quality data is an important part of creating a killer infographic, it is important to make sure that your information is all related to the same topic. Readers won’t be interested in a jumble of irrelevant facts and figures, so BEFORE you start designing, brainstorm and lay out a content map for your infographic. By organizing your information before you start creating your design, you’re sure to see what fits and what doesn’t. Infographics are a great way to show off the talents of your design team, so make sure to follow some basic design best practices. Use a vertical design with complementary colors, large fonts, and custom illustrations. An infographic is your brand’s unique spin on a tidbit of information, so make sure to customize the graphic to reflect your brand’s personality and make sure to include a logo! With the help of these simple tips, you’ll soon be on your way to creating an infographic that goes viral! Interested in building your own, but not sure where to start? Hubspot provides some user-friendly templates, click here to download them. Or, just contact the team at Small Screen Producer and we’ll be happy to help as well!